The story goes back a thousand years to the time when the heresy against the holy icons, Iconoclasm, was raging all over the Christian world. The Byzantine Emperor Theophilos had ordered, all holy icons be removed from the churches and burned. The Orthodox people were protecting and hiding the holy icons. They put themselves at risk of exile and even death for those icons. In the year 829 this Holy Icon of the Theotokos, which according to tradition was painted by the hand of St. Luke the Evangelist, was kept in a beautiful church in the renowned city of Prousa. Today the church still stands in the city named Brusa, which is in Turkey near Constantinople. Many miracles have taken place in this Church. As soon as the decree of the Emperor reached the city of Proussa, a godly man, the son of an officer of the royal court, decided to disobey the Emperor's order. He took the Holy Icon and fled to the mainland of Greece, because the persecution was less violent there. The young man was on his way to the city of Callipolis (today Gallipoli or Gelibolu). On his way to the city he lost the Holy Icon. His sorrow was great. “Alas, to me the wretched one”, he wailed. “The Lady Theotokos left me because of my sins”. However, he wouldn't turn back. He could not endure living amongst the enemies of the icons. He continued his journey and settled in the city of New Patra, near the northwest end of Peloponnesus. Time went by, and then one day he heard news about some miraculous events, which happened in an area of Aitola, Greece. This area was completely unknown and inaccessible at that time. The terrain was very rugged, with steep rocky mountains and deep chasms and abysses between them. Not even a small village was there, except for a couple of shelters for the shepherds. The area was not suitable to build villages. Even domesticated animals survived with difficulty. However, Christians sometimes would hide in these remote mountains trying to escape persecution by heretics or oppression by Emperors and Kings. According to the news, a child of one of the above-mentioned shepherds was keeping watch over his father's flock. One night the child was sleeping opposite the place where the cemetery of the monastery is now located (see photo above). Suddenly solemn and sweet chanting woke him. The chanting came from a cave that was behind him. Fearful, he looked around and saw a pillar of light coming out of the cave and reaching up to heaven. At first he thought that this could be a rainbow. By God's Providence it came to him that he would not die of fear or go out of his mind. He thought that this couldn't be a rainbow because it was straight and also it hadn't rained. In great fear he went and told his father what he had witnessed. His father thought it was the child's imagination. He told him not to be afraid of things that weren't real and not to be frightened by his own shadow. The child insisted that what he had heard and seen was real. Therefore, the next night, the child took his Christian father to the same place he had seen the pillar of light, to verify and confirm the vision. There, he saw what the child had told him, but would not dare go and see what was in the cave. The next day he took with him some other people and returned again. All saw the vision. Afterwards they searched the area and found the Holy Icon in the cave, radiant and shinning. They then venerated the Icon, and being joyful on finding this treasure, they arranged the area in order to keep the Icon there as a blessing. Everyday they brought candles and incense. How the icon came there is known only to him who took Prophet Avvacum from Jerusalem to Babylon, where Prophet Daniel was, and then brought him back. This is the first great miracle of the Lady Theotokos, the finding of Her Holy Icon. Oh young man, be saved, go in peace and do not toil any more. I am pleased to remain here in this rugged wilderness with the shepherds and peasants and not to be in the cities with people who preach heresies: and if you wish to stay with me come where you had found me. This will be good for you. Only the young man heard the voice. Obedient to the divine calling, he freed his servants, abandoned all his possessions, and with one of his servants, who decided to stay with him, went back to the cave where he had found the Holy Icon. He was certain that the will of the Lady Theotokos was that she lives there. The young man built a chapel in the cave for the Holy Icon. He and his servants were both tonsured monks by the Priest monk Raphael who was from the nearby hermitage of St. Demetrios. He received the name Demetrios and his servant received the name Timothy. Afterward he built a cell opposite the chapel in a quiet place away from the noisy pilgrims. He peacefully reposed there having lived a life pleasing to God. His disciple Timothy in the church he had built buried his body, and his blessed soul flew to heaven. This was the beginning of the Monastery of the All-Holy Mother of God of Prousa (or Prousiotissa). The Monastery has existed for one thousand years and still stands today. It has withstood the ravages of natural and manmade disasters. The main church, dedicated to the Dormition of the Theotokos, is in the cave. The ancient and incense-darkened Icon remains in the inner cave, surrounded by countless precious offerings. The offerings are truthful witnesses to innumerable miracles of times past and present. 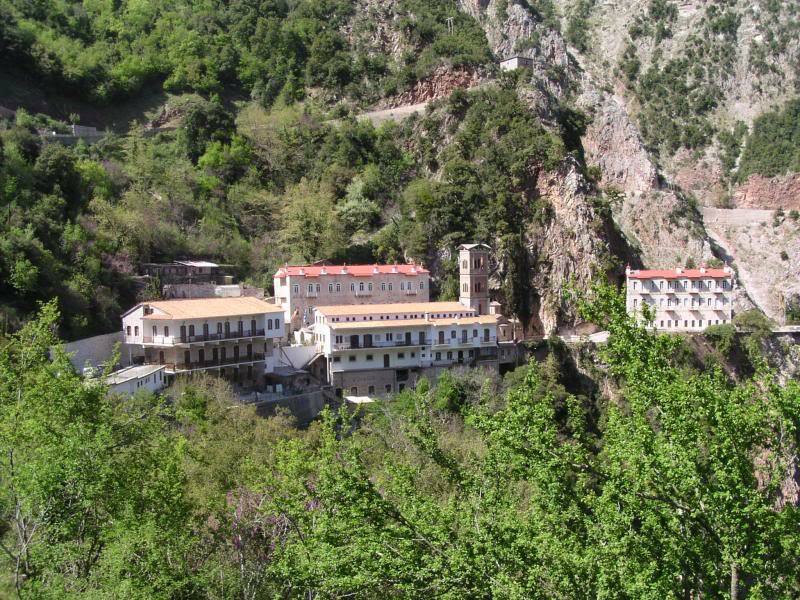 The village of Proussos has been built near the Monastery. The Icon awaits the crowds of pilgrims who flock there from the 15th to the 22nd of August, which are the days of the feast. In olden times the quiet of the mountains was disturbed by the voices of groups of people going to the feast. They had to walk on goat paths, among ancient chestnut, fir and plane trees. The journey was 15 hours long and the people carried baskets of food and bundles of blankets balanced on their heads. Riding on horseback was reserved for the old and the infirm. Some of them could be seen walking barefoot or crawling on their knees, fulfilling a promise given for a miraculous healing. The pilgrims would go there, light their candles of faith and stay overnight in the monastery's guesthouse or out in the open. In the morning people would attend a very early church service and then depart hoping to return next year. 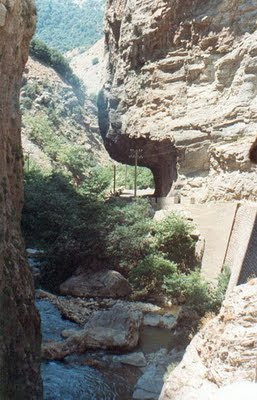 Today the monastery is accessible by car. The car inches patiently along the winding dirt road, which is carved on the steep mountain slope. 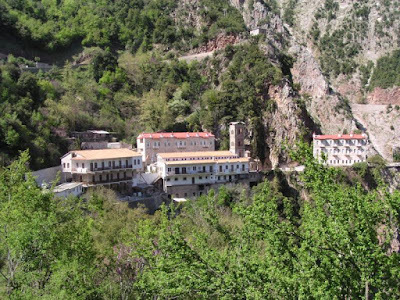 The road from the south comes to an elevated area called Stavros, from there the monastery can be seen perched on a recess of a precipice at the northwest corner of a narrow valley surrounded by mountain peaks. The pilgrim's patience is rewarded with a great blessing, the veneration of the Icon of the All-Holy Mother of God of Prousa. 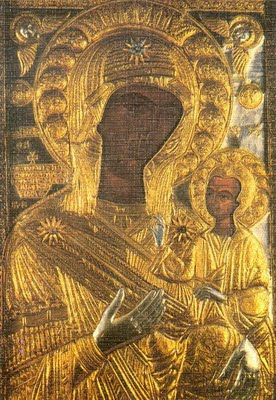 By thine icon of Prousa thou art shown forth as the great protectress of Greece and a worker of dread wonders All-Pure Virgin Mariam; for thou grantest sight unto the blind, thou dost cast out wicked demons and healest all that flee unto thee while crying: Glory unto thy childbirth without seed. Glory to Him that hath made thee wondrous. Glory to Him that worketh such manner of marvels through thee.